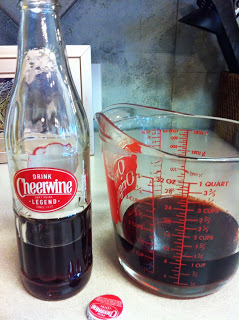 I made the Cheerwine Cake from this post for the church lady’s birthday. Picked up a 6-pack of bottles from World Market — my new hangout. I picked up a few other things to share with you for a blog segment on Bastille Day! Got to work making the cake. It’s always risky trying a new recipe on a friend. But, hey, if friends can’t tell you the cake was awful then who can you trust? The recipe is easy peasy. If you want it, post a comment. BTW, I love comments. It helps me to know I am not the only one reading my blog. 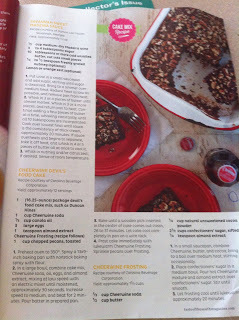 You basically take a box of devil’s food cake mix and add in eggs, oil, Cheerwine, and almond extract. I had to take a sip of the cola. It tastes like cherry Dr. Pepper married Mr. Pibb. I made a slight adjustment to the icing. It said to only use 2 1/4 cups of powdered sugar which I didn’t think yielded the consistency needed for the icing. I added another cup to make it a little thicker. 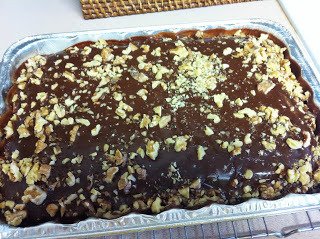 I sprinkled toasted chopped walnuts on top, instead of pecans. 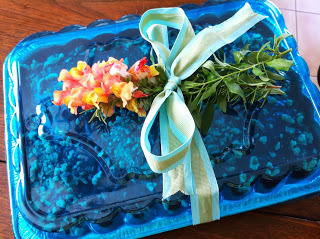 Wrapped it up in a disposable pan that came with a pretty blue plastic lid. Added a ribbon and flowers from my garden. Disposable pans are the best because they don’t have to be returned. Friends don’t make friends wash and return dishes. Stock up on them when they go on sale. 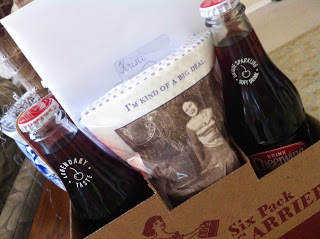 Gave her the rest of the Cheerwine for a birthday toast along with a cute package of napkins and a card. A fun, easy way to tell someone you think they are a really big deal. P.S. Church lady — if the cake is gross I owe you an Elizabeth Doyle’s cake. It’s a sure fire winner. Love you!